A volunteer-driven, professionally-trained and certified search organization serving Missouri, Kansas and surrounding areas. 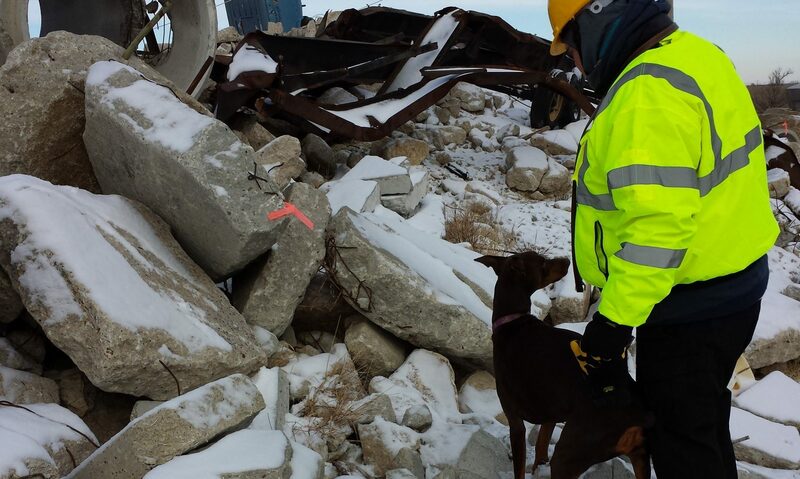 Snow Alley Search and Recovery is a Rescue/Recovery team of volunteer-driven, professionally-trained and certified search personnel serving the states of Missouri and Kansas and surrounding areas. Snow Alley Search and Recovery utilizes dog/handler teams and non-K9 personnel in association with members of the community, law enforcement and rescue personnel to search for lost or missing individuals in both urban and wilderness environments, in water and under ice. Snow Alley Search and Recovery subscribes to and promotes nationally recognized standards of training in search and rescue/recovery and certifications. All services provided by Snow Alley Search and Recovery are available at no cost to the public. Snow Alley is a 501(c)(3) organization in good standing with the IRS under the EIN number of 46-2135882 and is incorporated in both Missouri and Kansas. Lori has been in Search and Rescue since 2011, starting with ILSARC Ground Search, FEMA Wide Area Search, North Kansas City Police CERT, and adding Clair in 2013 to work in Human Remains Detection. 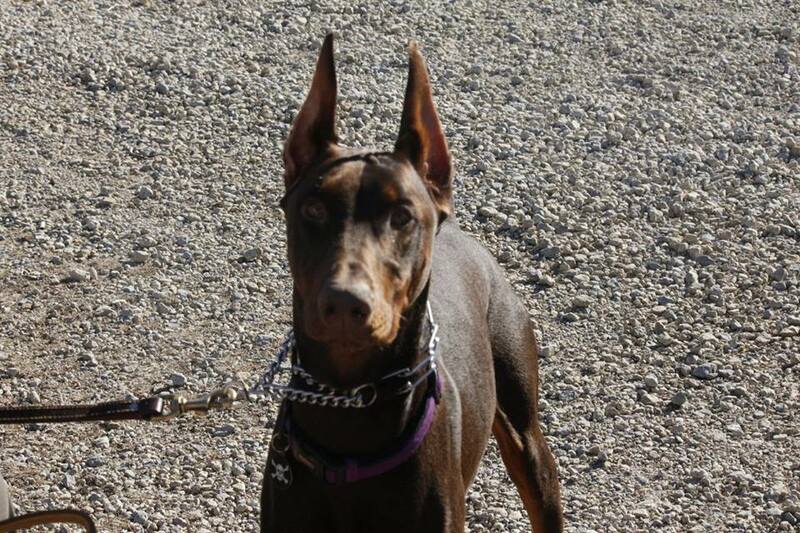 Clair is a First Stryk Doberman and has her Canine Good Citizen and is certified in Human Remains Detection through the North American Police Work Dog Association, Snow Alley Search and Recovery, and Michigan Search and Rescue. She will renew her certification spring of 2018 with the American Mantrailing, Police and Work Dog Association. She will also be taking her CGCA (Advanced Canine Good Citizen spring of 2018. Paul started in Search and Rescue in 2011 through North Kansas City Police CERT Team. 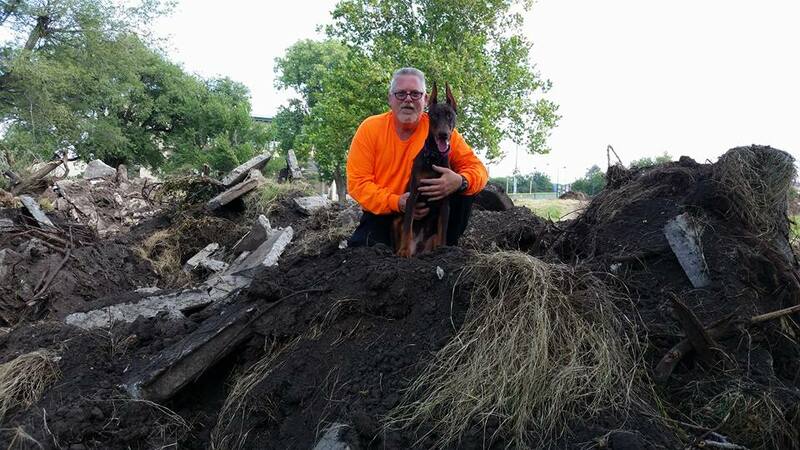 He has certifications through FEMA in Wide Area Search and ILSARC for Ground Search. 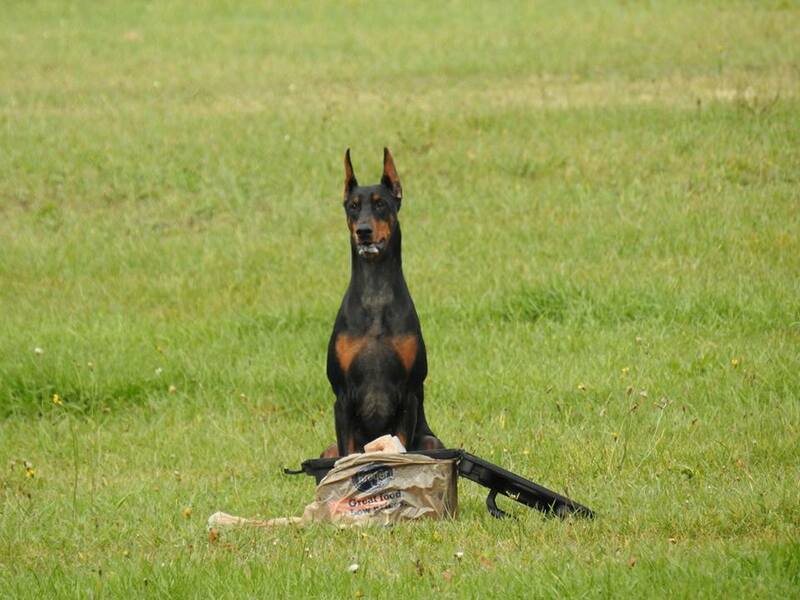 He has retired his first canine Gracie and is currently working a Beja Doberman pup named Benelli. Benelli will certify in Human Remains Detection fall of 2018. Debbie has been a member of Snow Alley Search and Recovery for five years. She is active in in ARES/ARRL and member of several area CERT teams. She is certified through FEMA in Wide Area Search and ILSARC for Ground Search and SASAR Ground Support. She is in charge of communications and ground support personnel. Debbie is a Registered Nurse and provides medical support. She keeps the team organized and on task. Snow Alley Search and Recovery is certified in Land Search through the Illinois Search and Rescue Council and able to utilize their members in land search for evidence and trail detection. Snow Alley specializes in Human Remains Detection and is certified annually through national organizations on land, water, building searches and automobile searches. The team attends multiple national training seminars annually and trains twice a week when at home. All members are 100% volunteer and Snow Alley Search and Recovery was incorporated in 2013 and received 501c3 status approval in Missouri and Federally in early 2015. All services are available free of charge to the public and must be requested through Law Enforcement, Fire or Emergency Management. Snow Alley Search and Recovery (SASAR) requires all members and their dogs to participate in stringent and frequent training exercises. Members and dogs are expected to train weekly, day and/or night, in all weather conditions on their own time and as a team on scheduled bi-weekly trainings. 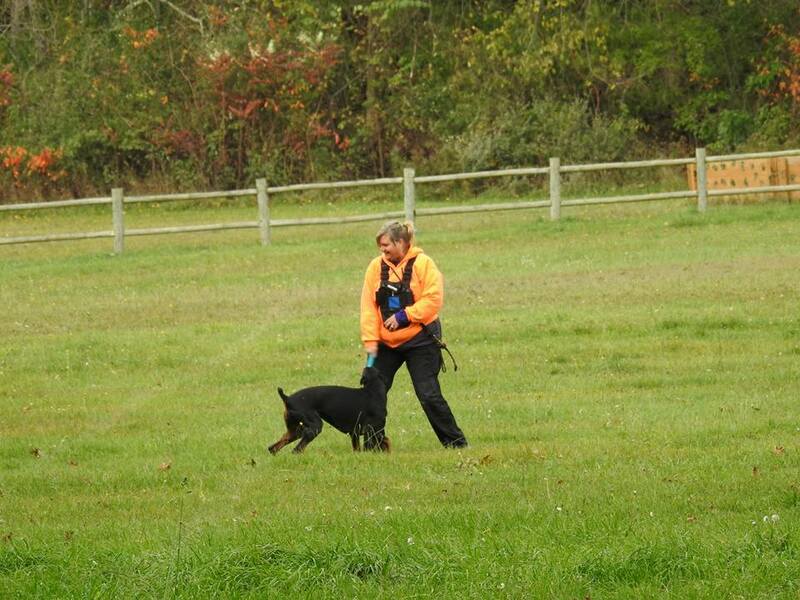 The training exercises should include mock searches with the dogs, indication stations, obedience with positive reinforcement, as well as member training in areas including but not limited to Incident Command System courses, Hazardous Materials handling, evidence Chain of Custody, radio communications, scent theory, canine psychology, CPR and emergency medical training for both the canine and humans, search strategy, clue searches, navigation/compass work and FEMA courses as determined by the team Vice-President of Training and Certification. A current list will be provided to new members. Members should attend trainings in their specialty when available. There is no mistreatment of canines or humans allowed. Members that do not participate in trainings will be inactivated at the Directors’ discretion and per attendance requirements. There will be a one year probationary period for new members to achieve the needed certifications for themselves and to learn to work with the team. Members may be handlers, flankers, scouts, medical support, navigation, business resources/supply acquisition and other specialties as needed. Canines must have their Canine Good Citizen certification, Advanced Obedience along with their Search specialty certifications and be current on vaccinations (including Kennel Cough and Flu) before deployment. Handlers and Field Support need to be up to date on vaccinations and their background check and have completed all of the appropriate requirements. SASAR operates on a total team philosophy and we support each other, train together and are committed to our altruistic goal of being the best we can possibly be in support of our Law Enforcement, Fire, and Emergency Manager requested missions. We do not ever self-deploy. We will not tolerate bickering and expect the time invested in our members to be respected and appreciated. Any issues within the team must be brought to a trustee or board member immediately. Our team participates in several annual trainings out of state and SASAR will assist with fees when possible and if funds are available but there is a financial commitment on your part. As we are a 501(c)(3) Corporation, we are able to have some fund raising opportunities to help offset some of our costs but you will be expected to participate to receive support. Each team member will be responsible for their own equipment purchases and expenses. This can include collars, kennels, and leashes, health certificates and vaccinations for the canines, educational fees, backpacks, go-bags, Personal Protection Equipment/clothing, flashlights, compass/navigational equipment, uniforms and more. Each new member must agree to a Federal background check that is run annually. You will be responsible for providing the team with a copy of your driver’s license, current vehicle insurance proof and vaccination records for you and your canine. You are also required to be current or in the process of vaccinations for Hepatitis A & B and Tetanus. It is strongly recommended that you consider the rigors and environments in which we work with our canines and strive to be in good physical health and fitness and of solid and stable mental health. We are responsible to and for each other and do not want a member to become a liability to the search. The Vice-President of Training and Certification will clarify the guidelines concerning physical capabilities.